The Death Of “Superman Lives”: What Happened? Review | Warped Factor - Words in the Key of Geek. Matthew Kresal gets paradoxical with The Death of Superman Lives. 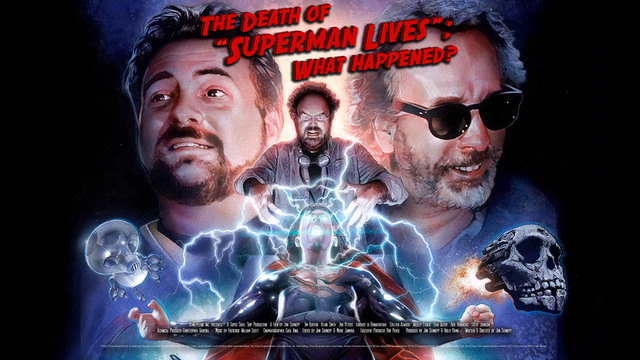 ...Or at least there hadn't been until the release of The Death Of “Superman Lives”: What Happened?, Jon Schnepp's documentary that, thanks in part to crowd funding, finally tells the story of the film that came so close to being. The thrill of this kind of documentary, even for films that are released, is the behind the scenes footage. Using a wealth of material that's been virtually unseen since 1997-98, Schnepp shows what was a quite active and lengthy pre-production phase for the film. 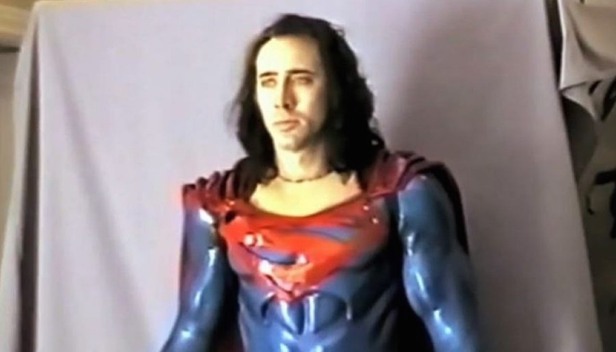 There's a large amount of costume tests being done for Nicholas Cage that takes in that now infamous photo (which Schnepp finds the exact moment it was taken in the old footage) but also him as Clark Kent and additional tests of the Superman costume that reveal something that looks far more familiar to fans. There's also concept art from the many different artists who worked on the film taking in sequences from the different scripts by different writers, it gives some idea of the visuals it might have had. The other thrill is getting to hear from the many and varied participants. Schnepp packs a lot of interviews into the running time and he gets some fine results by bringing in everyone from Burton to producer Jon Peters, all three writers who worked on the project (Kevin Smith, Wesley Strick, and Dan Gilroy) plus costume designer Colleen Atwood, and many of the artists who worked on the film. Sadly cast interviews are sorely lacking as it appears that the casting was still largely up in the air, though Cage appears both in footage from the time doing costume tests and in interviews in the years hence. The interviews are interesting and often show both the enthusiasm and frustration that came along with the project, from the struggles with the script to Peters as producer (which leads to some interesting stories that are sometimes contradicted by Peters himself) and exactly why the plug came to be pulled on the project. Yet there's also some regret that the film never got to be made and a lot of talk about what might have been. This all helps to make the interviews even more interesting. In fact, that's the big takeaway from this entire documentary: this is what might have been. Given that Superman Lives was canceled just weeks before production would have commenced, there's still plenty about the film that will never be known. In fact when the infamous picture of Cage gets mentioned, Burton and others are quick to point out that it was merely a test and not the final product on display in that image. Final designs hadn't been settled upon, neither had casting outside of Cage (though the film mentions Sandra Bullock or Julianne Moore as Lois Lane, Kevin Spacey and Christopher Walken as villains and Chris Rock as Jimmy Olson). The documentary gives us a glimpse into the pre-production period on a film that never got made and we can only extrapolate from this what we might have gotten on the big screen had the film come out in the summer of 1999 as planned. For that reason alone, it's well worth watching for any Superman fan. That being said, while it's essential viewing for Superman fans, it does feel perhaps a bit overstuffed. At 104 minutes it does feel overlong and gets perhaps bit too in-depth towards the middle and end of the film's turbulent history. That's in large part thanks to what eventually begins to feel like a seemingly endless sequences of concept art mixed with interviews where those involved try to make sense of events now two decades in the past. As a result, the documentary seems to come to nearly a sudden halt, quite like the real life production, though Schnepp does take the time to allow both former Warner's executive Lorenzo di Bonaventura and Peters the chance to explain why the film ultimately folded. I suspect though that most would prefer the film to be overlong than too short and it doesn't do it too much harm overall. For fans of the Man of Steel in whatever medium, The Death Of “Superman Lives”: What Happened? is essential viewing. You'll discover much that's new about the most talked about Superman film that was never made thanks to Schnepp's meticulous digging and interviews. Even if you walk away glad that the film never got made or perhaps still feel ambivalent about the whole thing (as I do), you're in for a treat.